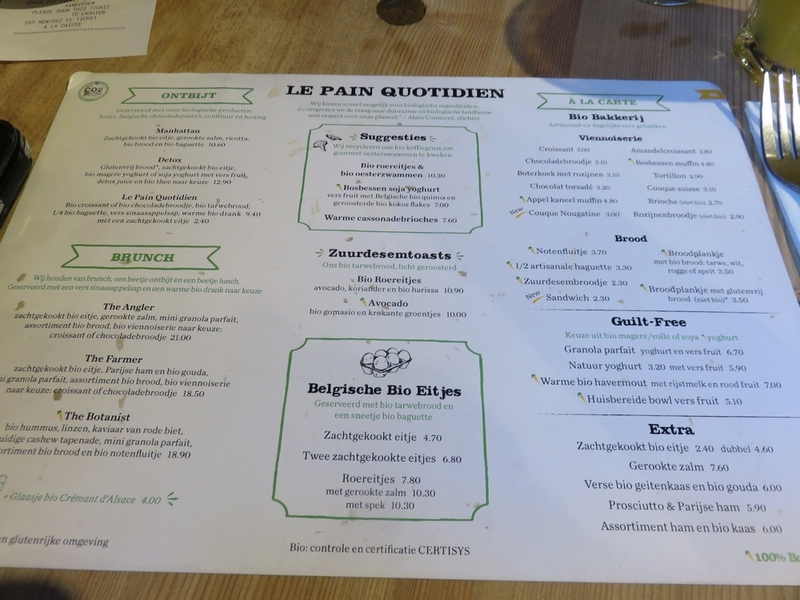 Restaurant review #102 – A couple of weeks ago, we visited the new restaurant of Le Pain Quotidien in Bruges, which opened in 2016. 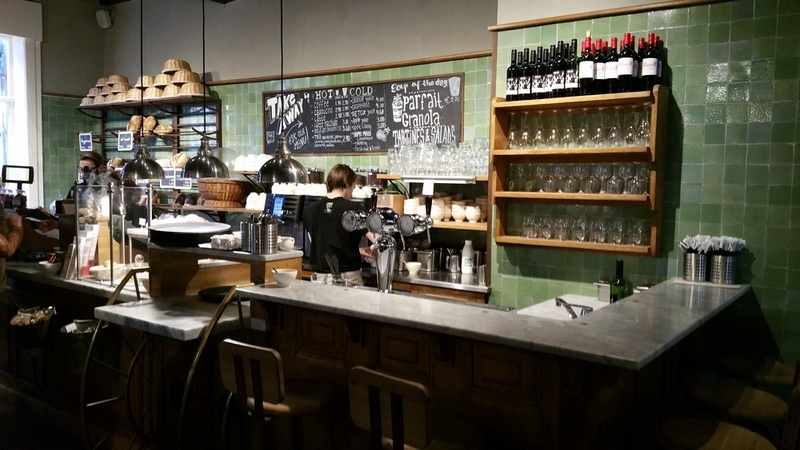 Le Pain Quotidien (LPQ) is a world wide chain of organic bistros, founded by Belgian Alain Coumont. 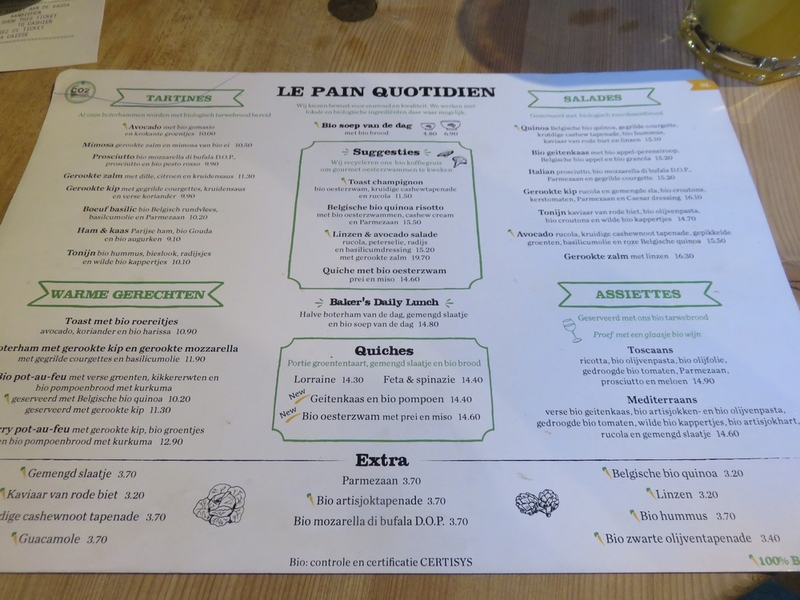 We already wrote some reviews of our visits to several LPQ restaurants (the first LPQ in Bruges, Hasselt and Louvain). 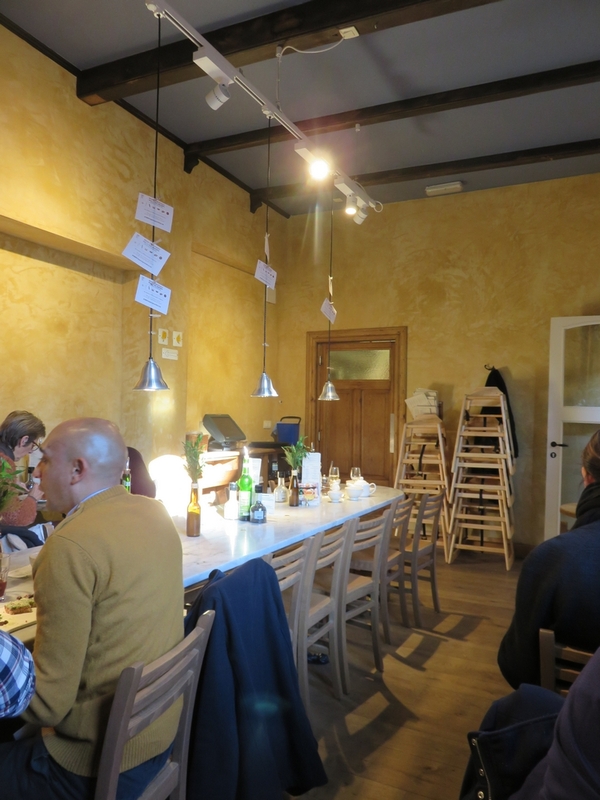 Alain Coumont has also started a vegan branch of bistros, Le Botaniste, of which we visited the one in Ghent (see our review here). 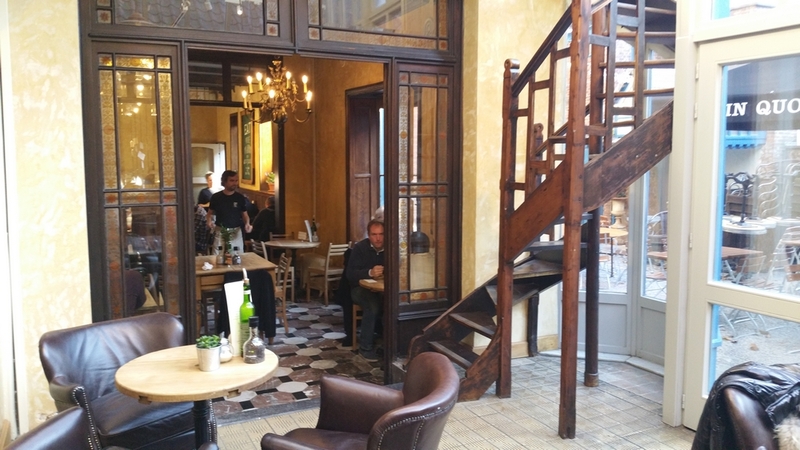 The second restaurant of LPQ is located in a nice building at Simon Stevinplein, just next to the shopping street (Zuidzandstraat). There used to be a weaving factory, and the building is nicely rearranged, with seperate dining rooms and a large terrace at the back. 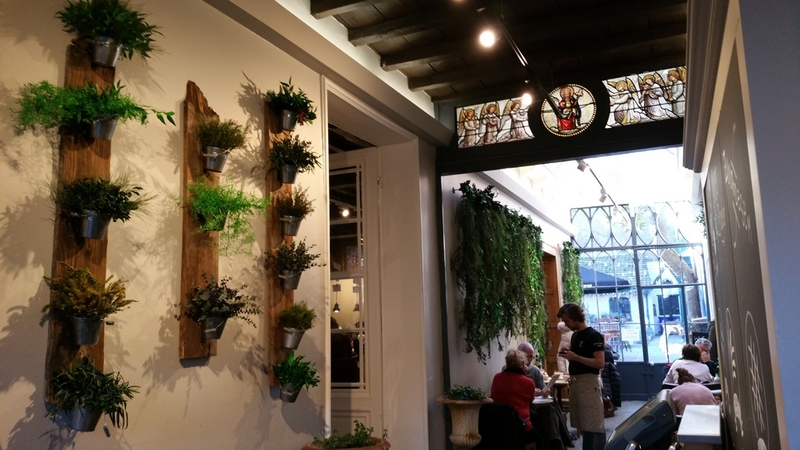 This second location of LPQ in Bruges is much bigger than the other one, and we found it much more enjoyable to have lunch here. 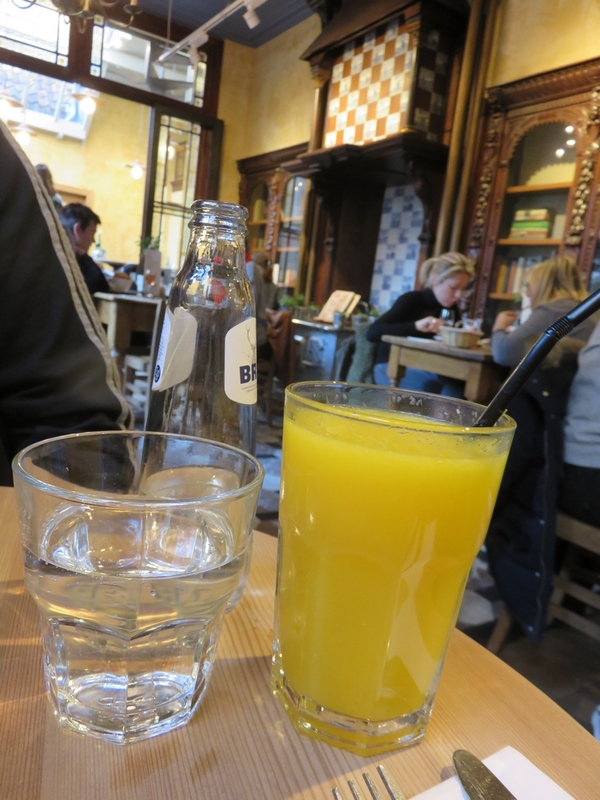 As in all Le Pain Quotidien restaurants, vegan options are clearly indicated with a carrot on the menu. 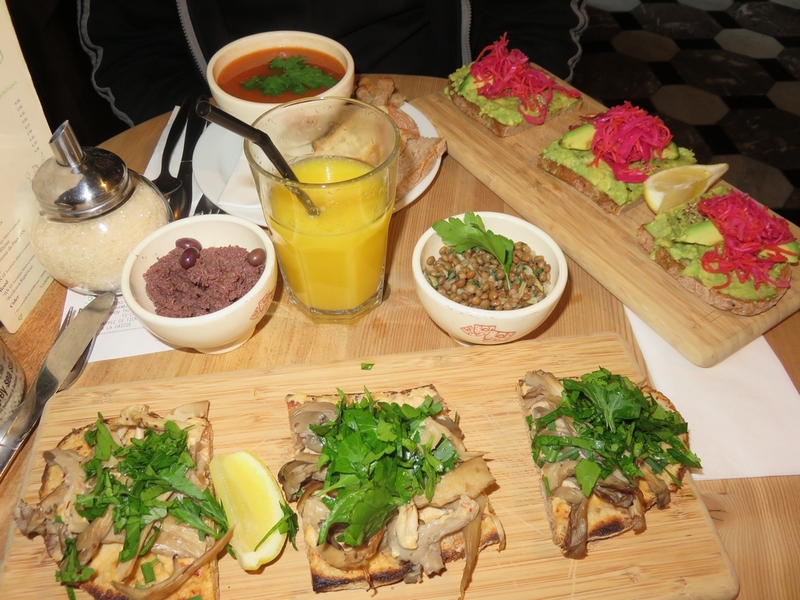 This is what we ordered: Toast champignons (11,50€), olives tapenade (3,70€) toast avocado (10€), and extra lentils (3,20€) and a small soup (4,80€). For drinks we had a large fresh juice (5,30€) and a sparkling water (2,70€). So our lunch in total was 41,20€, which we found quite reasonable. Service was very friendly and our orders came shortly. It was a bit of a hassle arranging everything on the small table, but we managed. We liked the food, although the toasts – being quite tough – are a bit unhandy to eat (difficult to cut through with a knife, but also difficult to eat with your hands!). It tasted good though. Only disappointment was that AGAIN the bread came with cow butter, despite having ordered everything vegan (and explicitly have checked the order for being vegan). This has happened on every one of our visits to LPQ. 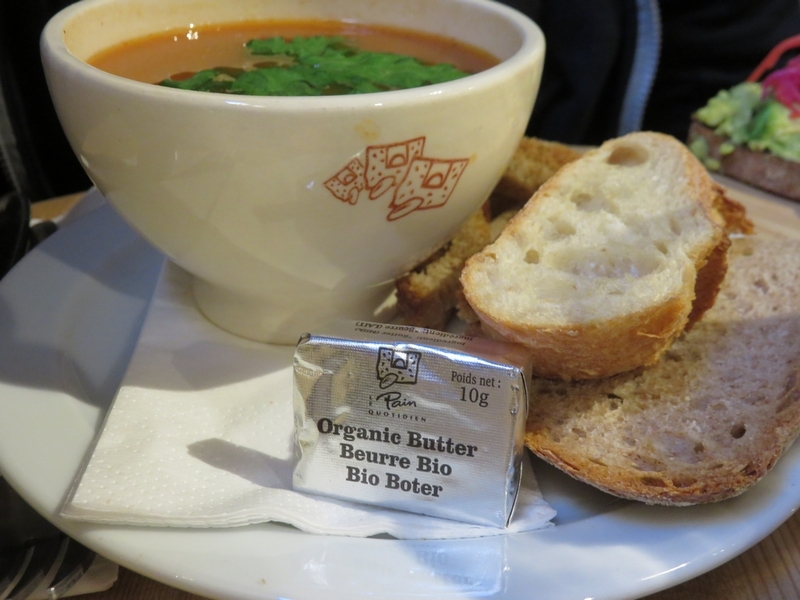 We would really appreciate if LPQ could offer vegan butter instead (or at least don’t serve cow butter with a vegan meal)! 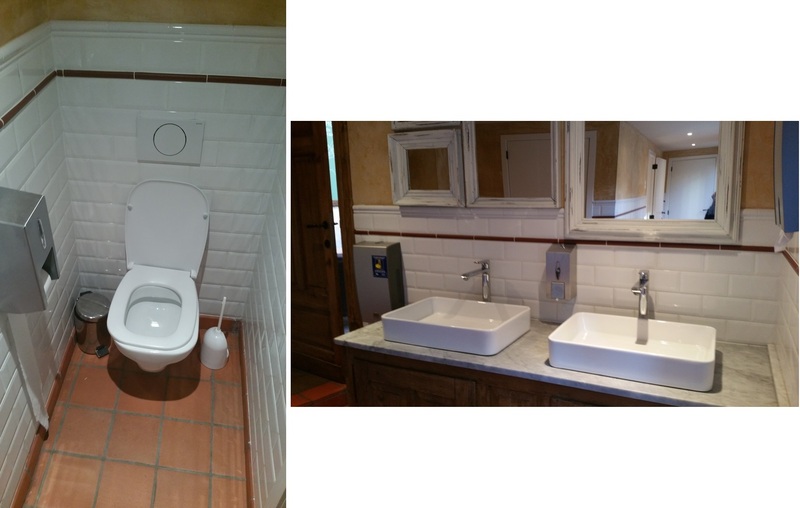 Toilet was nicely renovated, nice tiles and washing bassins. Walls of toilets were a bit dirty though and papers on the ground. 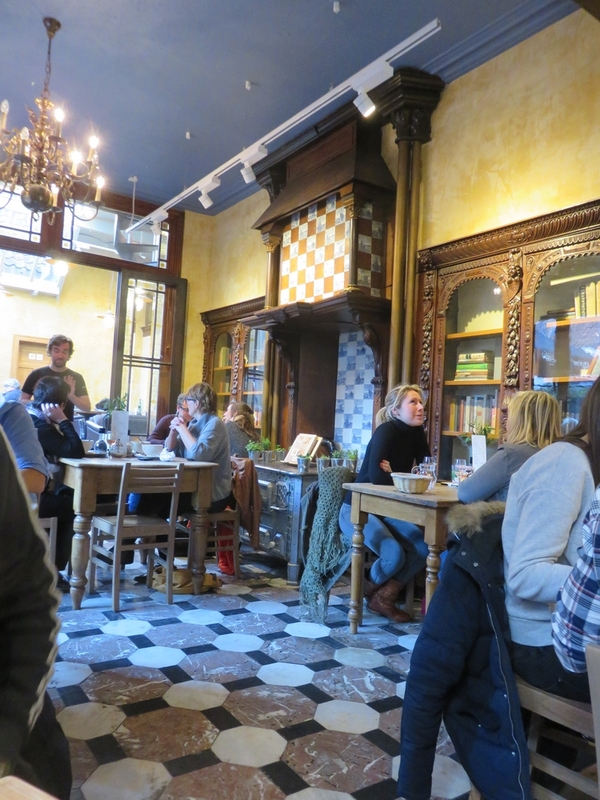 All in all, we had a nice light and quick lunch, in an enjoyable setting. 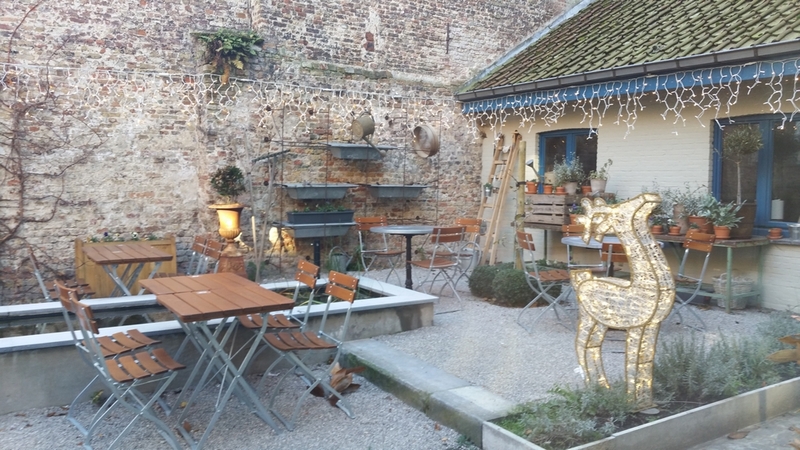 Glad with this new addition in Bruges. 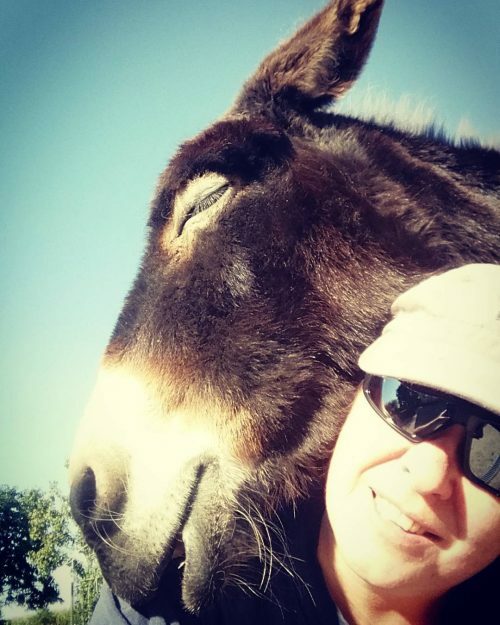 They include things like quinoa, chickpeas, avocado, zucchini…so it’s definitely very tasty. For the desserts it chagnes apparently from location to location. 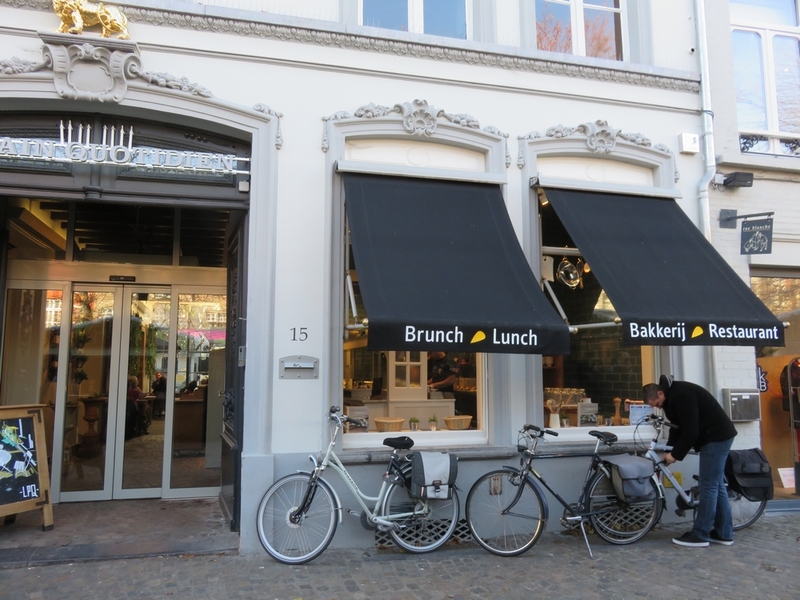 In Bruges we just had 1 blueberry muffin and none of the cheese cakes we are used to in other locations. I didn’t even know LPQ serves raw vegan cheesecakes in some locations! Have never seen that option!